The Government of the State of Acre in Brazil is participating in the REDD+ SES Initiative since 2010. The State of Acre is developing a REDD Program under the System of Incentives for Environmental Services (SISA). REDD+ SES is being applied to the SISA. The SISA law includes social and environmental principles that need to be addressed and respected. These were defined based on the REDD+ Social & Environmental Principles & Criteria developed by Brazilian civil society in 2010. The State of Acre is using REDD+ SES indicators and process to monitor how the social and environmental principles of the SISA law are addressed and respected. A multi-stakeholder Commission of Validation and Monitoring of the SISA (CEVA - Comissão Estadual de Validação e Acompanhamento) was created to oversee the implementation of SISA. The Commission was established by state law No. 2.308, Article 12, in October 2010 and functions as a balanced representation of government and civil society. 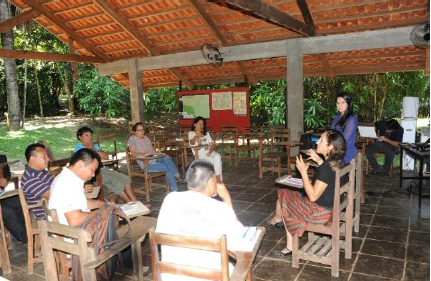 The use of the REDD+ SES in Acre has been facilitated by the Instituto de Mudanças Climáticas (IMC) and CARE Brasil field staff between 2010 and 2012. Since 2013, the IMC is facilitating the use of REDD+ SES in close coordination with CEVA..
Country-specific interpretation of REDD+ SES indicators to fit the context of the State of Acre has been done through a series of working group sessions and consultations including public comment periods. A first version of the Acre-specific indicators was developed by a small working group composed of the facilitation team and a local environmental expert. It was posted on the IMC website and distributed to stakeholders for public comment from 27 July to 27 September 2011. In paralle, a series of workshops were held to discuss and receive inputs on indicators from small farmers, rubber tapers, Indigenous Peoples, civil society, federal and State of Acre government and municipalities between July and September 2011. A second version of indicators responding to the comments received during consultations was presented by the facilitation to CEVA that approved it March 2012. Further inputs to the indicators were received from women’s groups, Indigenous Peoples and IMC which led to the publication of a third version of indicators and a monitoring plan that includes verifiers and source of verification for each indicator in June 2012. Further adjustments were made to the indicators and monitoring plan and CEVA reviewed and approved the final version of indicators and monitoring plan in March 2013. Acre-specific indicators and process of interpretation are available in REDD+ Social and Environmental Safeguards Monitoring Manual in the System of Incentives for Environmental Services. In 2013, the State of Acre developed with support from Imaflora a methodology for social and environmental safeguards of SISA and private carbon projects. The methodology includes a check list for each indicator to collect information and a monitoring cycle for SISA and for private carbon projects. The methodology was presented and discussed with stakeholders in a workshop in August 2013 and validated by CEVA. The complete methodology for monitoring of social and environmental safeguards is available in REDD+ Social and Environmental Safeguards Monitoring Manual in the System of Incentives for Environmental Services. Based on the monitoring methodology, the IMC collected information from diverse sources to develop a draft assessment report of performance of the SISA against each of the Acre-specific social and environmental performance indicators. The assessment report identifies all the policies, laws, regulations, processes and procedures that are in place to address each aspect of social and environmental quality identified in the indicators, and provides some assessment of the quality of their implementation. The draft safeguards assessment report was reviewed and approved by the CEVA in early 2014. A summary of the draft assessment report which provides an overview of progress and gaps for all the criteria and indicators was developed by IMC to help stakeholders to understand the information. The summary was published, after approval by CEVA, for public comment 7th October to 7th November 2014. A series of consultation meetings were held with different stakeholder groups including rural producers, Indigenous Peoples, social movements and culminated in a big meeting with the three State Councils. These meetings and the compilation and analysis of comments were facilitated by a civil society member of CEVA representing the Central Labour Union (CUT). The response to comments and the final report were reviewed and approved by CEVA in December 2014. The State of Acre, Brazil, is the first country to have completed the full ten-step process of the Guidelines of the REDD+ SES Initiative. A certificate was emitted based on the assessment of the REDD+ SES International Review that assesses the quality of the process followed to assess how safeguards are addressed and respected in the country in relation to governance, interpretation and assessment, i.e. 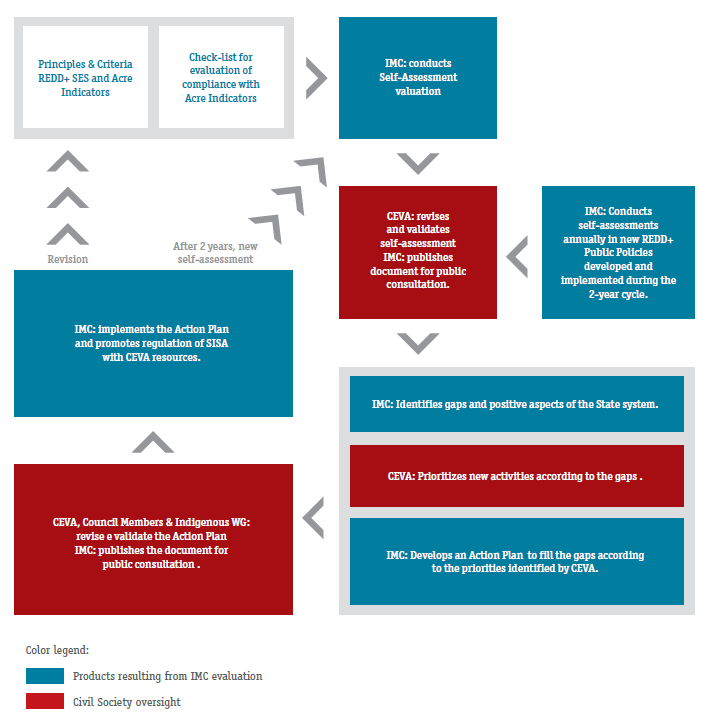 the ten step REDD+ SES process defined in the REDD+ SES Guidelines Version 2 (November 2012).